With the advent of the cloud and the investments made by companies such as Google, any business can now afford to implement some of the best in class collaboration tools and technologies that all large businesses are using. We would even suggest that not only can all businesses afford these services rather all business CAN NOT afford to not be using Google Apps. Let's take a deeper look. Back when we first started supporting the technology needs of our customers, no one had yet heard of the “cloud” and Google was a search engine used for simple web searches. Around the same time, email services were separated into two categories. The first type of email service was low cost POP/IMAP service that allowed its users to send and receive email messages of limited sizes. The second was built on technologies such as Microsoft Exchange where users had a more elaborate suite of services they could use to collaborate with other users through messaging, document sharing, etc. The problem with this second solution was the initial investment to set up your own servers and administer them. This prevented most small businesses from ever gaining the competitive advantage of using these incredible collaboration tools. Fast forward almost 20 years, with the advent of the cloud and the investments made by companies such as Google, any business can now afford to implement some of the best-in-class collaboration tools and technologies that all large businesses are using. 1.) Email – Obviously this is the most popular of the Google App services. Every time we move a client to Google Apps, Gmail this is the first service we implement for them. The reason for this is that it simply works and it works well. Everything from the amount of storage you receive in your mailbox down to being able to pull up emails on any device connected to the internet makes Google Apps the obvious choice for your email needs. 2.) Google Docs – Most people use Microsoft Word or Excel for their data processing needs. With the cost of those products increasing, Google introduced their Google Docs as a cloud based competitor to Microsoft's traditional products. Our clients love using Google apps in a collaborative environment, allowing all employees to access their documents from anywhere. They also do not have to worry about data backup since Google backs everything up to multiple secure data centers. 3.) App Integration – Many folks do not realize the power of Google apps until they look at the ever growing list of apps that Google integrates with. Most software companies these days will work with Google's API services to integrate their own products with Google. One of the best examples for our clients is the Google Apps Integration with HubSpot. 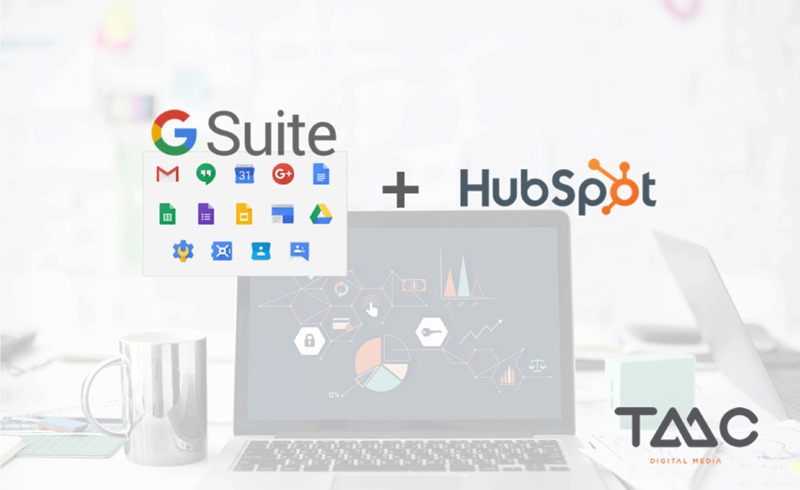 Once HubSpot and Google Apps are connected, every customer interaction you have with Google is easily viewed in HubSpot, and any appointment set in HubSpot is synced to the Google Calendar. The true power of Google Apps comes once you connect it with apps such as HubSpot and leverage both product suites to grow your business with this competitive advantage. In closing – Google is constantly reinvesting into the suite of products to help businesses of all sizes. By having a large company such as Google in your corner, providing you the tools and resources that not to long ago was only available to the larger companies should really excite any business owner who wants to be out in front of industry trends. If you are not yet using Google Apps, we strongly suggest the minimal investment there is to get your company moving forward with Google in your corner. Interested in learning more about the G Suite and/or how it integrates seamlessly with the HubSpot CRM? Let's talk. Book some time with Erik now.